Being the huge Star Trek nerd that I am, I’ve watched nearly every episode ever made. Over time I’ve come to realize that the Ferengi, little troll-like profiteers, are one of the more underrated species that populate one of my favorite universes. 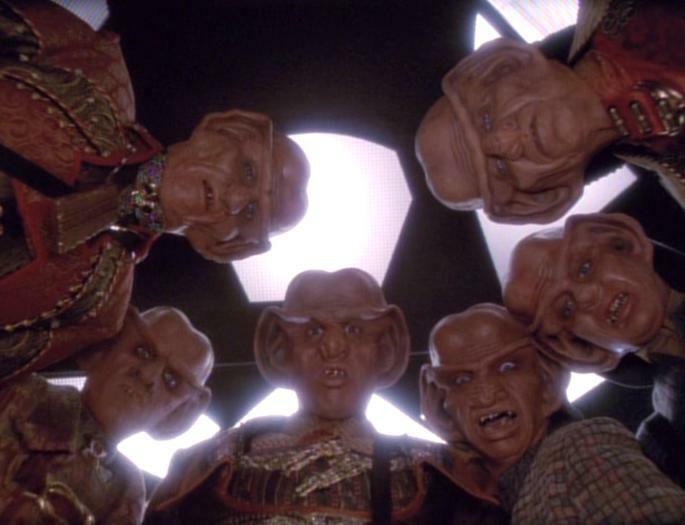 With that in mind, I’ve decided to list my top ten favorite Ferengi-centric episodes. Of course there are side plots involved with all of these episodes, but each of them has the main focus of the episode squarely on the Ferengi. Whether the Ferengi are portrayed as heroes or villains, all of these episodes are worth a watch. 10. “The Ascent” – I’ve always loved the Quark/Odo relationship and I honestly think this is one of the better depictions of it. After crashing on a planet, Quark and Odo must climb a mountain in order to call for help. The catch, of course, is that it is freezing cold and they only have one survival suit. As the episode progresses, the two must rely on one another at the same time that they don’t trust each other at all. Eventually, the two get rescued—though it is in large part thanks to Quark, who despite is outward dislike of Odo, feels a strong kinship with, and respect for his longtime nemesis. 9. “Rules of Acquisition” – One of the earliest DS9 episodes to deal with the Ferengi, it’s also one of the first times we see them moving away from the sniveling creatures that were usually featured in The Next Generation. This episode also has the distinction of introducing the Dominion for the first time, though there is almost no hint at what they would later become. I also enjoyed the more fleshed out characterization of Grand Nagus Zek, as his first appearance in “The Nagus” was pretty unimpressive. Additionally, there is a touching side plot involving Jake and Nog that really warms the heart. 8. “False Profits” – I’m a sucker for a call back. If creators can bring back some minor plot element from another episode, or in this case another series, I’m hooked. Way back in the Next Generation episode “The Price,” two Ferengi were stuck in the Delta Quadrant on the far side of an unstable wormhole. Flash forward several years and Voyager just happens to be passing by this same part of the Delta Quadrant; hilarity ensues. While not the best episode of the series, it was nice as a light hearted distraction from a series that had some really dark moments. 7. “Bar Association” – For most of DS9, at least until this point, Rom was a highly underutilized and undervalued character. He spent most of his time getting yelled at by Quark or yelling at Nog often in that order. “Bar Association” finally lets Rom shine and finally gives him more of a personality. It also marks the return of Liquidator Brunt, one of several characters played by the very talented Jeffery Combs (also known for playing Wayoun on DS9 and Shran on Enterprise). While the episode is mostly about Rom trying to get better working conditions at the bar, it also shows a very conflicted Quark trying to decide between his traditional Ferengi values and his care for his brother and employees. There is also a lot of Chase Masterson in this episode, who is one of my favorite Star Trek actresses. 6. “Family Business” – This episode is the first time viewers are introduced to Quark and Rom’s mother Ishka, and she is… something else. 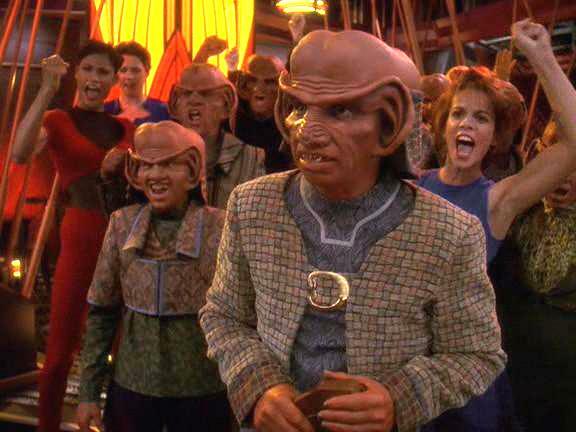 Ferengi society is highly sexist and there are law against women leaving the house, earning profit, and even wearing clothes. While “Rules of Acquisition” deals with Ferengi women a little bit, this episode really picks up the theme, as Quark’s mother is doing all kinds of things she isn’t allowed to. As it turns out, she is awesome at it, earning more profit that Quark could even fathom. In later episodes she ends up becoming Grand Nagus Zek’s lover and pretty much running the entire Ferengi Alliance from the shadows. For now though, she is content to have her own, rather impressive financial empire. 5. “The Battle” – While the first appearance of the Ferengi was pretty lame, this episode, just four later, was significantly better. It’s one of the first episodes to provide a window into Captain Picard’s past, which has been pretty hazy up to this point. In addition, it introduces the idea that, while the Ferengi are generally thought of as profit seeking and not to be trusted, not every member of the society is like that, which adds some depth to the species as a whole. DaiMon Bok is motivated solely by revenge, but his first officer acts in a more noble fashion, even if nobility is also in his best interest. It speaks to the strength of The Next Generation as a show that Bok comes back near the end of the series, still bent on revenge, and that it makes for a great episode—even seven years later. 4. “Ménage á Troi” – Ferengi might focus on profit, but that doesn’t mean they don’t have a heart. A rather amusing situation emerges when a trade envoy falls madly in love with Lwaxana Troi, mother of Deanna Troi, and kidnaps the two women, along with Riker. Lwaxana is always fun to watch on screen and her repulsion at the love of DaiMon Tog is pretty entertaining. There is also a particularly funny scene in which the Troi women are beamed to DaiMon’s location, sans clothing. The episodes ends with Picard pretending to proclaim his love for Lwaxana by spouting as much random Shakespeare as he can think up on the fly. (There is all kinds of culture in Star Trek.) As a side note, Majel Barrett-Roddenberry, who obviously appears here, is the only actor to be in every Star Trek series. 2. “Little Green Men” – Pretty much everyone has heard of the supposed alien crash outside of Roswell, New Mexico. Apparently it is less common knowledge that Quark, Rom and Nog crashed in the desert after accidentally traveling back in time. Look, it’s Star Trek, just deal with it. The idea of mixing the Ferengi and the American military in 1947 is brilliant because there could not be a more ridiculous pairing. This is one of the funniest episodes of Star Trek ever written, and it is also the second funniest thing I’ve ever seen about the Roswell incident, after a similar episode of Futurama. Needless to say, the trio doesn’t succeed in turning Earth into a profit generating machine, and once again Quark turns up basically empty handed. 1. “The Magnificent Ferengi” – Hands down this is my favorite Ferengi episode, which is why it is number one. It has all kinds of call backs, including Empok Nor, Cousin Gaila, ex-Liquidator Brunt, and Keevan. It also features Quark’s mother Ishka, who is always amusing, and even has a cameo by Iggy Pop. The episode loosely parodies The Magnificent Seven except for the fact that the entire team is completely inept. When it becomes obvious that their initial plans for an assault won’t work because, let’s face it, they aren’t cut out for combat, the Ferengi fall back to their natural gifts of negotiation and profit-seeking to achieve their goal. Of course these same qualities lead to other problems with humorously bad situations ensuing. While I’m sure that I have forgotten something, this is a pretty good primer for anyone who wants to dig a little deeper into Star Trek. The franchise might focus for the most part on The Federation, but there is certainly more to the universe than that. put the episode numbers in the description……. The Nagus!! A great episode with a touch of homage at the Godfather. BodyParts, was a good one!